I am so ready for some cooler temps. It was actually in the high 70's in the middle of the night. Which is a start for us Floridians. I love this sweater so much! I just love how it looks like it has a shirt underneath. 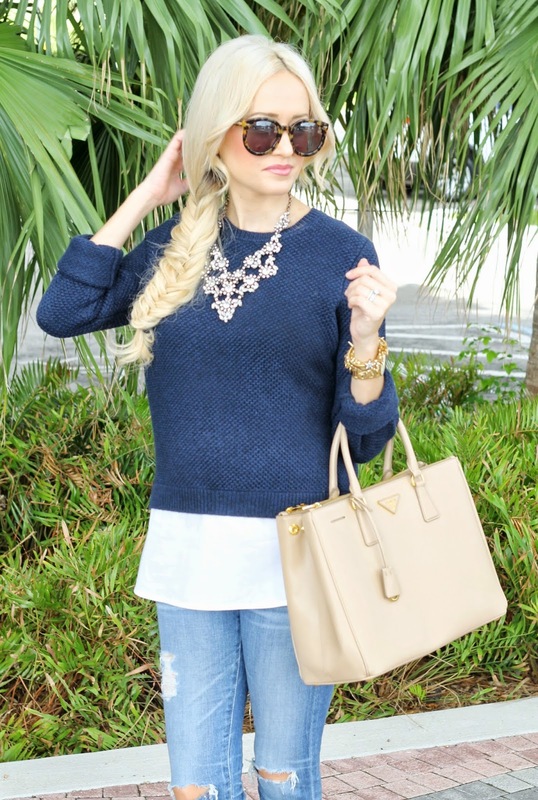 I am a huge fan of layering in the Fall and this sweater just makes it so easy. I can't wait to wear it with a fun leopard or plaid scarf. And it is 25% off with code SHOPFORFALL. I also am really loving the plaid puffer vest that I linked below. I have a striped one but I might need the plaid one also. Happy hump day. Thanks for stopping by. I love that navy sweater !!!! 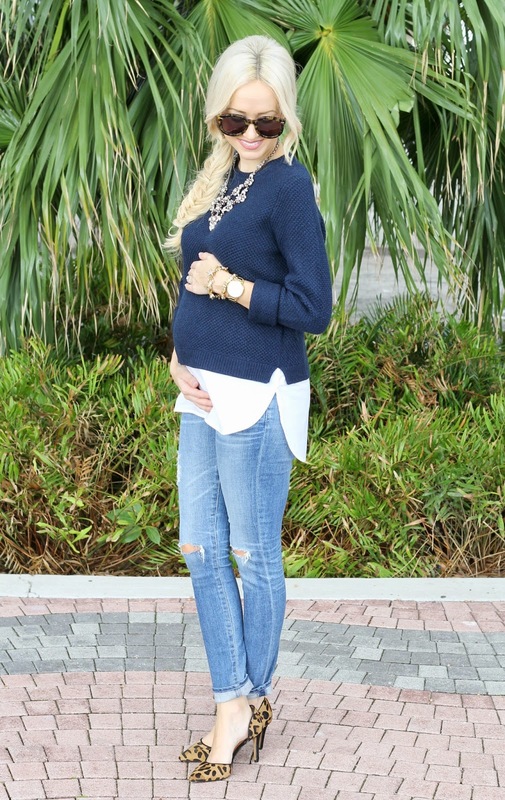 Love, love, love this - your best ootd post yet! I've been debating on this sweater, but seeing it on you just sealed the deal. 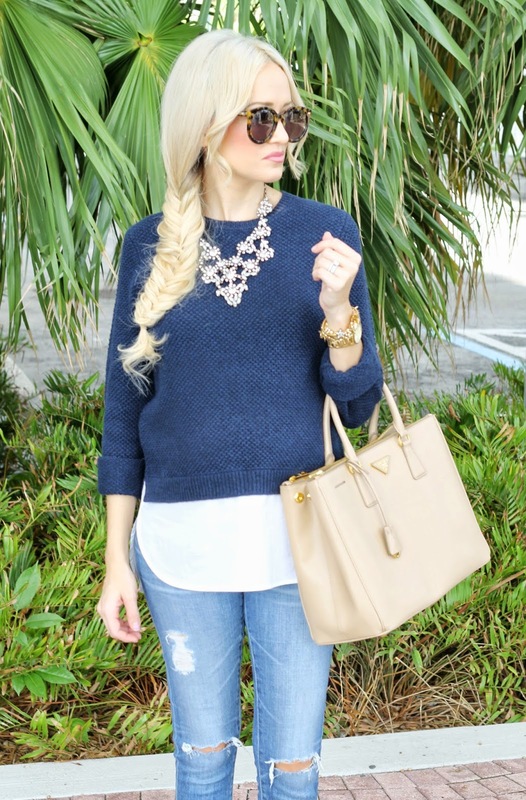 I love that navy sweater and those leopard heels together! Such a great combo! this outfit makes me jones for fall! such a great outfit even when florida is still kind of burning up compared to the rest of the country. definitely going to have to take on a look on j.crew's site! thanks for sharing! Love your casual look. I must admit that I'm a sucker for leopard print! Love this outfit!! Beautiful with the leopard!! Oh so cute!! I love how you made this work for your bump!!! This is such a great look for fall!! Always beautiful, Jade! Love this look especially with those gorgeous heels! loove the purse. great post!